Nevada Gov. Brian Sandoval plans to sign a bill will let homeowners with solar panels sell excess electricity to their utility at retail rates, his office says. Some of Nevada's largest solar installation companies plan to resume doing business in the state. For the past year-and-a-half Tesla (formerly SolarCity) and Sunrun stopped seeking new customers in this sunny part of the country because the state's Public Utilities Commission chose to phase out incentives for homeowners who install rooftop solar panels. Now, Republican Gov. Brian Sandoval plans to sign into law a bill that brings back "net metering." Net metering has been a key reason for the rapid growth of the residential solar power business across the U.S. It allows homeowners with solar panels to sell excess electricity to their utility at retail instead of wholesale rates. This appeals to many homeowners because they can do something good for the environment and save money on their energy bill. Utilities are not fans of net metering. That's because every kilowatt generated on a home roof is one less that the local utility sells. And some of that money utilities collect is used to maintain the electric grid. In arguing against Nevada's net metering system last year, the state's largest utility, NV Energy, echoed an argument that utilities across the country make. Berkshire Hathaway owns the utility and CEO Warren Buffet said on CNBC that when solar customers don't pay to maintain the grid, non-solar customers are left to pick up the tab. Utilities like NV Energy argue that amounts to a subsidy for homeowners with solar panels. Solar advocates say the utilities are just trying to protect their monopolies. The new legislation in Nevada strikes a compromise. Homeowners with solar panels on their roof will be able to sell any excess electricity their household doesn't use to the utility, but at a reduced rate. Currently that's 95 percent of the retail rate. That number will go down as more rooftop solar systems are installed in the state. The Nevada law also creates new protections for homeowners, such as a guaranteed net metering rate for 20 years. "Nevada is one step closer to a policy that will allow it to get back thousands of solar jobs that were lost," says Sean Gallagher, vice president of state affairs for the Solar Energy Industries Association. The SEIA estimates more than 2,600 jobs were lost when the large solar companies stopped doing business in Nevada. 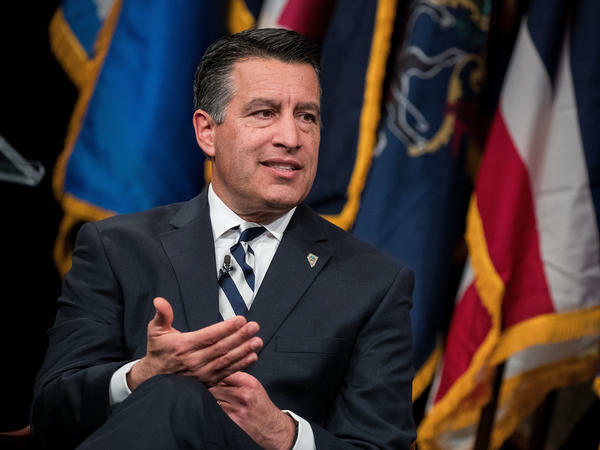 Sandoval's office tells NPR the governor plans to sign the new bill into law next week.